Get ready for some pool time football! This fun floating game will give you and your friends hours of fun. 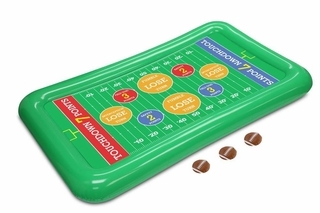 The inflatable football field floats on the surface, and you get three football-shaped discs to throw at the board in hopes of scoring a touchdown! Material(s): PLASTIC Weight 1 pounds Dimensions 54" x 0" x 0"